A great way to use video on desktop that both monetizes well AND enhances your user's experience. Video can be time consuming and expensive to create. So options are good! At Mediavine we understand that most things are not One-Size-Fits-All. Learn how to use the Sticky Desktop Video Player and decide which settings are best for you! What does the sticky desktop video player do? 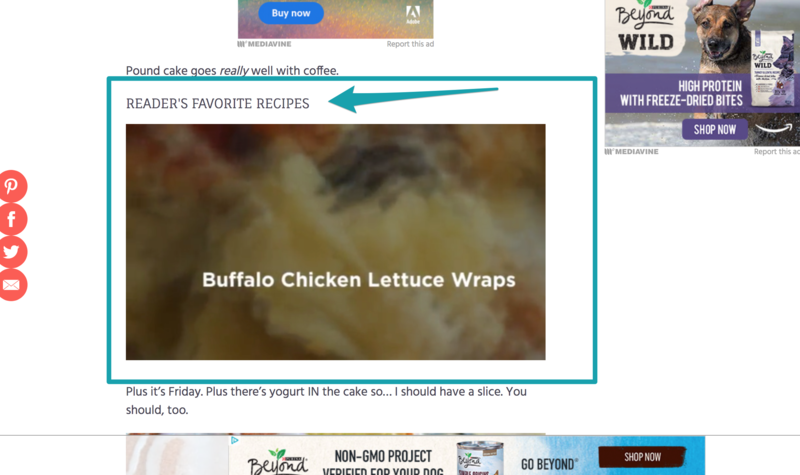 If enabled, the sticky desktop player will play a video and then, as the reader scrolls through the content, it will "stick" like your sticky sidebar ad with the reader. This maximizes viewability and ad revenue, and it's important to note that this feature only works on desktop. You must have videos in your Mediavine Video Library in order to enable the sticky desktop player. There are several options for how to enable the Sticky Desktop Player. This option will take any videos that you have embedded in your posts and "upgrade" them to sticky. This is a site-wide setting - no need to change things on a post-by-post basis! 1. Head to your Mediavine dashboard. Navigate to the Video tab. 2. Click "Video Settings" and scroll down to the Desktop Sticky Player (BETA) options, and check the box for Auto-Upgrade Existing Video to Sticky. 3. Scroll to the bottom of the page and click Update Settings. Now your existing videos are upgraded to sticky! If you haven't created a ton of post-specific videos, but would like to take advantage of high-paying video CPM's on all of your desktop traffic there's another setting you can enable! This option will take your Featured Video and automatically insert it on any post that DOES NOT have a post-specific Mediavine Video embedded. It's a great place to use a "Latest Posts" or "Popular Content" type of video. 2. Click "Video Settings" and scroll down to the Desktop Sticky Player (BETA) options, and check the box for Auto-Insert Sticky Featured Video . This option only works with certain themes and layouts because it moves the sticky player from the sidebar side to the CONTENT side of the page. With most themes this setting covers content and may not be the best option for user experience. If you want to try it you can just check the box for "Stick Player to Content Side", and then scroll down and click Update Settings. You can use this to help readers distinguish between a post-specific video tutorial and a slideshow or montage of reader favorites. The text you enter here will appear in-post above any video you have AUTO-INSERTED. The font will mimic your site's H2 in post, but the text does not stay with the video as it moves to the sidebar or content side when the reader scrolls. Scroll to Play! We love this feature so much it has its own help article. It lets you choose where in the post you would like your desktop player to load. TIP: Below the Fold lets the video lazy load which is great for site speed! The default setting for the placement is at the top of the post. Changing the initial placement lets you push the video further down in the post using various "offsets" ranging from small (towards the top) to extra large (very far down in the post). We suggest enabling a Medium Offset to test this out with your theme, and then you can adjust up or down accordingly. If you made any changes that you want to save since your initial selections be sure to click Update Settings to save the changes. 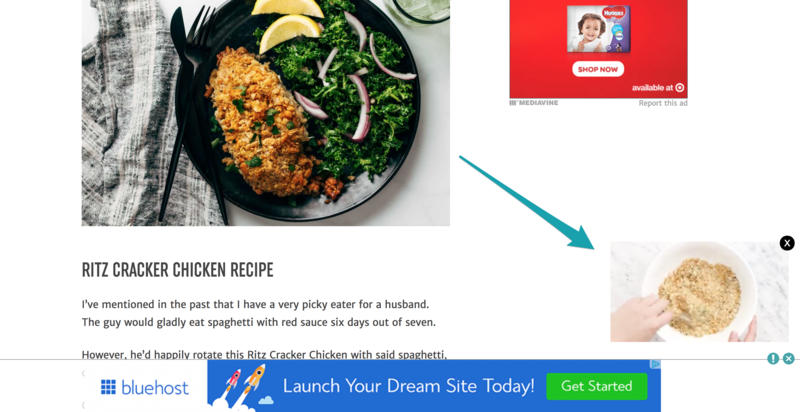 Want to try out the sticky desktop player in just one post OR do you want a sticky video to STAY WHERE YOU HAVE EMBEDDED IT and ignore your site-wide settings? You can find easy instructions to do that in this article. If an ad autoplays with sound, please report it to us by clicking the "Report this ad" button under the video player. Please make sure to check the box for "It plays sounds" and also include "MPN" + the name of the advertiser in the description of your report — this helps us identify the ad faster so we can work with our partners to get it blocked. Learn more about reporting ads. This unit is in beta, so if you notice a bug or have any feedback, please email publishers@mediavine.com.